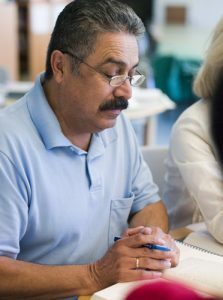 Free instruction to help adults improve their English language skills – for the workplace, to prepare for college, or for everyday life. Classes are offered at beginning, intermediate, and advanced levels, or have multiple levels in one class. Instruction includes reading, writing, listening, speaking/pronunciation, and grammar; many classes offer supplemental technology-based instruction. All ESL instructors meet the teacher minimum qualifications for their districts.